Senkou no Night Raid is at a glance a show with great potential, beginning with its unique setting: Shanghai, 1931. Japanese occupied China showcases the height of Japan’s imperialist power and ambition. However, the show cries out for an in-depth commentary on Japan as an imperialist power. Such a narrative would provide a window into how people in Japan currently feel about the period. The Japanese are clearly still very sensitive and defensive. Even 60 years after the end of WW2, whenever China or Korea reflects on an embarrassing colonial issue, like Korean “comfort women”, the Japanese forcefully deny official government involvement. Even though Night Raid is only half way through its television run, there has been little evidence so far that its creators are willing to delve deeper and do a critical examination of Japan’s colonial history. In 1931 Shanghai’s citizens were seething with resentment, both at the failures of the Chinese army and the indignity of Japanese occupation. Instead of recognizing this, Night Raid paints a happy picture of occupation, almost as though the occupation should be remembered as a happy time in history. If it weren’t for some of the show’s “city folk” speaking Chinese, you might even forget the show was set in China. The show is actually very similar to Darker than Black. I would classify Night Raid as an action/spy series, featuring a small team with super powers who complete missions for the Japanese government. Each episode weaves in a back story about the characters that explains their motivations for joining the army and fighting for Japan. The missions provide a small level of amusement, the interaction between the character’s powers is fun to watch, and the animation quality itself is excellent. The noir aspect of the show reminds me of Baccano!, but the show lacks both Baccano’s strong story and its deep characters. Plus, it is hard to pull off a noir, spy drama when one of the team members is psychic… it doesn’t take an ace detective to solve a crime when you can read the suspect’s mind. All that would be forgiven if the show displayed the kind of political overtones that would have made it unique. At most, it leaves a modicum of hope that the creator’s will address the political undercuts in the second half. By about episode 6 the only hints the show provides that tensions simmer between China and Japan is a scene of momentary panic by the city’s residents when a bomb explodes, triggering a mob rush fearing that war is upon them. These come far too late in a 13 episode series, a show that could have provided a rich glimpse into the Japanese psyche instead will at most scratch the surface of how the Japanese feel about their complicated history. I suppose I’ll have to hope for a second season. Anime directors, please don't change your depressing endings. I love them. Taiwan is pretty nostalgic about being colonized by Japan, but the mainlanders and Koreans are definitely still bitter. Can’t really blame them. It’s not the average Japanese person who is in denial, it’s the average politician. More importantly, though, is should I bother picking this up? I just contrast the Japanese and German reaction to WW2. In Germany a whole generation really grappled with the ills and evil of the Nazis. In Japan, even without the atrocity of the holocaust, you would think that some kind of similar reflection would have taken place. Instead, it seems like whatever blame existed was buried, blamed on “contractors.” That’s why Senkou no Night Raid was such an exciting concept. I thought, maybe this would be Japan’s Dancing with Wolves. Instead we get a show that is basically a less interesting Darker than Black. I’d hold off on picking it up for now. I’ll do another review if the second half does a 360 and gets amazing. It pains me that you even compare Night Raid to Darker than Black. In my opinion, DtB is barely watchable, I’ve been able to watch the first 4 episodes only because people keep telling me it’s great, hoping that it’ll become more interesting when the main plot kicks in. The characters are unbearably boring and the plot confusing. Only the settings are somewhat interesting. Night Raid, on the other hand, is worth watching just for the superior production quality. You can really see that they’ve put some effort into this, given that the anime actually presents realistic martial arts moves (I recognized an Aikido move in the first episode), and the Chinese people actually speak Chinese and the Russian people speak Russian, everybody doesn’t speak Japanese. The story and characters are also about 50 times more interesting than those of DtB, at least to me. You have a point, though, about the lack of a Chinese view to the occupation. I just today watched Jet Li’s Fist of Legend, which deals with this very subject, and it was a rewarding watch – after all, it was my third watch, and I still found new things to think about in that movie. It’s definitely a worthy subject, and I also hope that Night Raid will later take a deeper view into that subject. However, even if it doesn’t, it’s still a very entertaining anime with the potential to become one of my favourites. I totally understand your view on Darker than Black, but I personally agree with the people who asked you to give the show another chance. The first time I watched DtB I also couldn’t get past the first couple of episodes before I lost interest. DtB had the advantage of a 26 episode first series. That gave it enough time to recover from a slow start. Night Raid only has 13 episodes to make its mark and I don’t think it has enough time to develop a compelling story. I’m from Taiwan and am currently living in Japan. Your statement is not entirely true. The Japanese collaborators in Taiwan were never persecuted. Many of them still retains great wealth and a share of influence in Taiwanese politics. These are the people who are most nostalgic about Japanese occupation and most anti China. Imagine a France in which Vichy collaborators are still in power. Of course they would miss the “good old days”. However that is not true for the majority of the Taiwanese people. As for modern Japanese, whether willingly or not, they are kept ignorant and oblivious about that blank part in history. Schools “fudged” WWII history, hinting that Japan had to defend itself against western imperialism. Most Japanese don’t know what exactly happened at that time. Many don’t want to know. I tried to start a conversation about WWII, and a friend just pretended he didn’t hear me and asked me what I had for lunch. Did you manage to catch the (web-only) episode 7? I haven’t started watching this yet, but I have read that episode 7 is the one where the story deals with Japan’s triggering of the Mukden Incident. Anyway, I think reading nationalism into anime is always quite interesting, especially in terms of the bigger hits– for example, Code Geass is quite politically driven, while Gasaraki is another one that has a quite anti-Western sentiment. 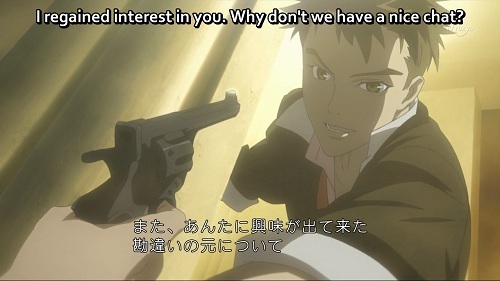 It’s a sort of weak connection, but I’ve always thought of anime’s dealing with history as somewhat similar to the textbook debates that go on in Japan over what to include. Anime seems to take it farther than the comfort women story thing you mentioned; in military matters anime is quick to align Japan and the United States (usually with a black military commander who is too eager to use weapons, but that’s another story…) and isn’t it weird how Japan seems to fight against Nazis when the opportunity arises? Shrugs. You have to keep in mind that Night Raid is not a documentary, just a fantasy story. It’s not going for full-scale realism (it wouldn’t really have time for it, anyway). We could say that it takes place in a fantasy version of Asia. Also, I think part of the problem here is people approaching this anime with Western expectations, so to speak. Sure, over here we expect entertainment treating controversial issues being outspoken and critical. Not so in Japan. Night Raid is very careful about where it treads, it’s like walking on a tightrope, and I think so far they managed quite well. I’m so tired of people calling this show nationalist or revisionist. It may not openly criticize but it has its moments (Aoi saying flat-out that Japan has no right to decide over the fate of China comes to mind), and if you watch episode 7 you’ll see that it’s not exactly going for revisionism. It might put more emphasis on Japan than China, for obvious reasons, but I think the way it deals with the issue of the Japanese aggression is quite admirable for an anime series, especially since it’s such an extremely sensitive issue for Japan and the entire Far-East region as well. (I’m surprised it didn’t cause a diplomatic scandal yet.) It’s a cartoon about something that is incredibly uncomfortable for its audience (and indeed the entire country) and tries to approach it in a sensitive and sensible way. I think this is already more than what we could’ve expected from an anime series, it’s unreasonable to expect more. I’m sure this is just my Western way of thinking but I think regardless of the overall quality of the show, the creators were quite brave to even tackle an issue nobody really wants to talk about. I always feel the need to point this out: in the webcomic version of Hetalia there’s a story about China raising little Japan (sort of) that ends with Japan attacking an unsuspecting China (cuts him across his back with a sword, apparently). It’s a lot less serious than it may sound, but even so I’ve always thought it must’ve taken guts for a Japanese man to put something like this into his silly, lighthearted webcomic written for a Japanese audience. Unsurprisingly, when the anime adapted this story the part with Japan attacking China was left out, and so far the story has not been printed either. I certainly agree that Night Raid has to tread very carefully and I look forward to seeing how they address the issues in the 7th episode. I guess I am disappointed because I think that if Night Raid had adequately addressed the historical issues it would have been a special show, transforming it from a so-so spy/action series into a meaningful experience that would really push the anime genre forward. The show’s decision to avoid confronting the issues head-on (barring a change in direction going forward) is a valid one, but without the historical aspect Night Raid just isn’t super compelling show, or at least not compelling enough for me to recommend that people watch it. Hopefully after watching Episode 7 I’ll change my mind. It’s been a long while but I wonder – have any of you managed to finish this show? I marathoned it a while ago, and I must say it left a deep impression on me. It’s still flawed, of course, and maybe without the historical aspect it would’ve been just another a run-of-the-mill anime, but the historical aspect was handled so well that it added a lot of gravity to the show and made me take it seriously. (This is especially true for the epilogue, that is, episode 14.) It’s still no Japanese apology (I think it was never meant to be one, though), but I found it sufficiently poignant and thought-provoking. So, I’m curious if any of you watched it to the end, and if yes, what you thought of it. Not yet. I was always hoping to come back to it but never got the chance. I’ll try to finish it up this week and I’ll let you know what I think. I’m looking forward to it. 😀 I’m not sure if you’ll like it as much as I did, but I’m interested in your opinion.